Playing with Electrons to Make Stories: CRABS!!! Forgotten halls on forgotten giants. The Pashan structures were moved and guarded by massive crabs. Hidden beneath the sand and ornate shell, lays a titan creature that may not be dead. The crabs were artisans, capable of creating their own shells through sculpting regurgitated prismatic sand turned into glass. Though possessing an alien psychology, they possessed a keen intellect. An entire caste of the Pasha, the crab herders, were responsible for communing with these creatures. Deep within the crabs lays a small nuclear furnace allowing them to derive sustenance from the sand and spit molten glass. 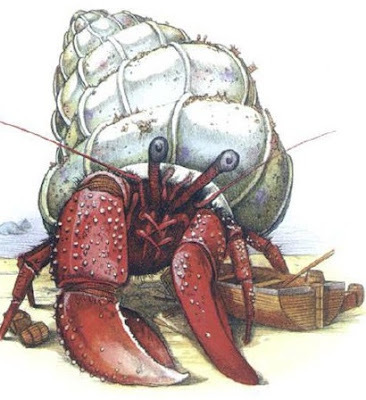 There is a 1 in 12 chance that a crab will still be living, the crabs being legendary for near limitless life spans. 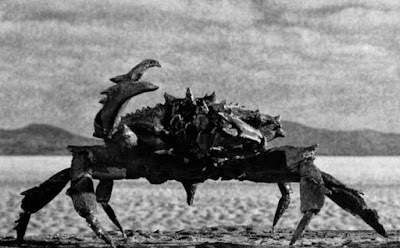 Rarely, an unfortunate group might find a zombified crab, its dead body now animated by the strange forces inhabiting the desert. There is a 1 in 6 chance the crab will be a zombie. Up next, more tables for the crap you find inside the shell! Also, thank you Patrick Stewart (the cool writer, not the uncool spaceship captain) for adding me to his blog roll!